I have been suffering lens envy for several years ever since Cody got her 100mm macro, even though I rarely shoot macro. Recently, Don surprised me by ordering this lens for me . It seemed appropriate to take it out on its maiden run searching out bees for the June challenge. Unfortunately , as the story will tell you, bees are in short supply... almost as scarce as the lambs from a previous month. I have no idea what kind of bee this is as this is the first time I've seen a fuzzy, all yellow one. Once upon a time there was a girl who hated honey. She swore it tasted just like the cod liver oil she was given as a child . Years later, and after she took up bread baking at her home in Canada, she discovered Fireweed Honey - OH, YUM! As its name describes, fireweed springs up where a forest has been burned, either intentionally after the area has been logged, or after natural wildfires. The heat and increased daylight (from loss of trees) cause the hibernating seeds to germinate. It is an amazing transformation to witness acres and acres of logged forests, looking like an atom bomb has gone off, covered the following summer with an explosion of pinks flower spikes. Apiarists (beekeepers) control the flavor of their honey by placing the hives among the chosen flowers. The honey from bees who feed almost exclusively on fireweed is sweet, but not cloying, floral, but not overly so, with hints of fresh air and the sea. But there is a sad note to this story. A fast spreading virus has decimated many hives putting many apiaries out of business. Our girl's original supplier went bankrupt and it was not until years later that she found another supplier, lost that one, found another... you get the picture. This year, the bees around her home have been even slower to return. 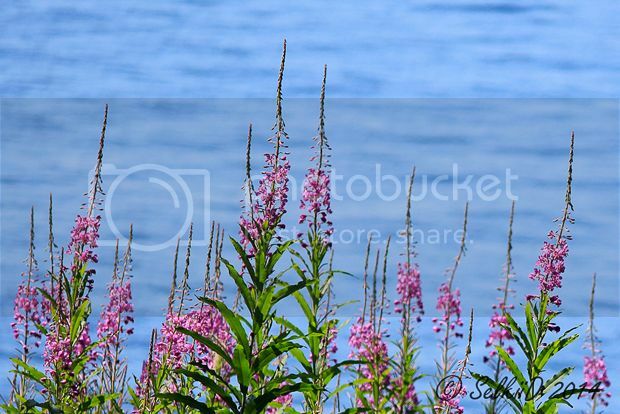 The photo was taken today (June 27th), the first day bees turned up in any numbers in her home garden just as the first fireweed are beginning to bloom. It is worrisome that these are but a fraction of what used to be a joyous burst of buzzing. Fingers crossed, more will follow. PS To see what I've been up to on my latest trip up north, visit my Flickr page via the link below. PPS Have I said how much I HATE Photobucket!! You have NO IDEA what I went through to get two photos uploaded! I wanted to share my "First Day of Summer" with you guys even though we are no longer formally doing the Solstice/Equinox shots, but could not get it to upload! That's why I decided to just direct you to my Flickr page. Arrgghhhh!!!! 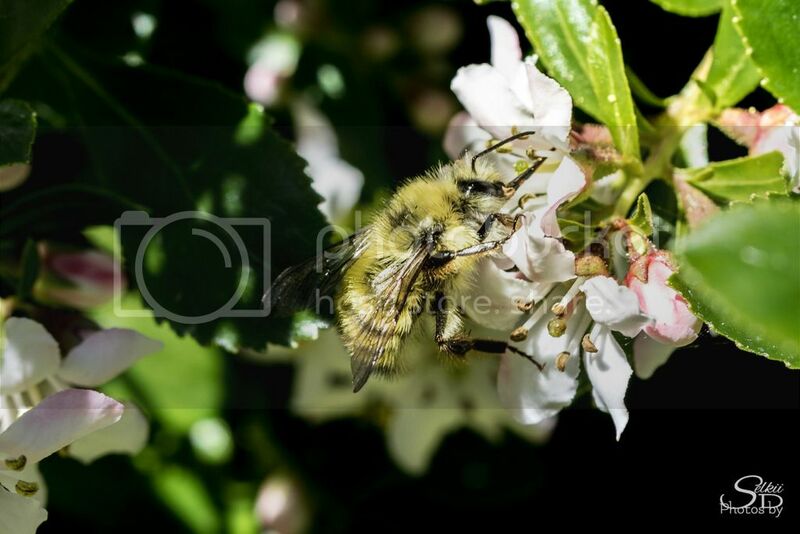 That looks like Bombus Perplexus...common name is Confusing Bumblebee...and is seen across Canada. Great story and good to see you are in macro world. I don't use my 100mm enough but it's still good to have it there when something special crops up. Talking of Photobucket it seems they have changed their terms to no longer allow 3rd party hosting, hence all the ugly banners where my photos used to be. I'll be looking elsewhere for hosting as this is tantamount to holding all the old images to ransom and now suddenly demanding that I pay for their services. It's been a nightmare to use for some time now as you have to fight through multiple pop-up ads every time you try to do something on their site. I see some nice pictures came up while I was busy at work this week. I also see that Photobucket is trying to be even more annoying. Guess I'll have to make sure I pull all my photos off photobucket to save them and rehost them somewhere else. Odd as all my photos feed from Photobucket and I haven't had that problem. Nevertheless, with all that has gone wrong with PB, I might break down and just post them from my personal website since MF and family links to albums are the only reasons I do that. I only dread having to rebuild all the albums I have there. The thought of it sends me into inertia. With Flickr having been sold, and 500px expanding into paid tutorials, I wonder if there is a change in the air regarding free photo sites. Unless you have a paid membership already or have purchased from them in the past you will probably get hit eventually. They have been rolling this out for a couple of weeks apparently. I have paid for my account in the past for several years so am particularly annoyed that my images are now being held to ransom. I think you are right though, these companies no longer see it as something that should be offered for free, and I'd be happy to pay a reasonable subscription but not this. I wouldn't be surprised to see PB close down in the near future. It's likely that mine will be posted from private server space shortly instead of relying on one of these companies. Like you I dread the thought of trying to rebuild all the links on here and other forums. By the way, PB is nuts with plan pricing. $40/mon or $400/yr to allow 3rd party hosting? No thank you. I've gone with imgur...until they copy PB of course. I did email PB expressing my disappointment withy their new policy. I explained I have had an account for many years, a paid membership for most of that time and that I only went back to the free one when I lost my job. I don't suppose it will even get read let alone replied to or acted upon. But I'll report back if they do. I haven't been affected yet though I know someone local who's photos totally disappeared. I checked my account this morning and the layout of PB is different, so change is imminent, I'm sure. Will check out Imgur and other possibilities when I have a chance though am not on computer much lately except to edit photos. Unsurprisingly there was no response from Photobucket. Well, apart from the one saying "how did we do?" and asking me to rate their customer support. Difficult to rate non-existent support lmao. Oh and of course when you click on the link to report bad support it just brings up a blank page. Hi Guys! Since it has been so quiet here, I thought I'd let you know what I've been up to. Seems I NEED a creative push, so I'm trying something totally out of my wheelhouse... interviewing strangers, getting their photos, and writing up their "story" for two groups on Flickr: "100 Strangers" and "The Human Family." Loving it!! Meeting the most wonderful people, even if they don't end up agreeing to the photo. As for Rory's Cubes, I am missing the interaction with you guys, as if this was the last gasp of our dwindling group. I really hope not and that we can stay in touch some how. It is terrible if we let Photobucket's greed be the cause of our demise. I've lost longtime friendships in the past to the blackness of cyberspace and would regret it happening here. That does sound like an exciting project. How have the reactions been, or rather how do you initiate the conversation? Is it worth having some other things going on on an ad-hoc basis on here - maybe the guess the close-up object that we used to do. I usually get a vibe that a particular person might be interesting. I always start by just talking with them about something we are both experiencing at that moment. Since I've only done 4 officially (1 not official, but that's another story), the approach has worked. The first two "strangers" were at a raptor center photographing birds as I was, so we had a basis to start up conversing. The third was someone working at a entrance kiosk at an historic lighthouse and, again, it just flowed from the usual banter you might have at a tourist location. The last was a young man who stopped to photograph the same tree I was photographing (you will have to read the story to understand). In each case, although we were all strangers, we were involved in something mutual. I haven't gotten to the stage where some of the members are where they just walk up to a person on the street and ask for the photo. Often, in those cases, they don't get a "story," and, to me, the story is almost as important as the photo. There is no timeline to produce "100 Strangers;" on the contrary, they encourage taking one's time. The Human Family group seem even more attuned to this being a wonderful and exciting experience, not one to just tally up how many strangers you can meet. All I can say is that it has opened me up to being more creative in other genres of photography. Can't quite explain the phenomenon, but it gives me more courage to try new things, pursue new subjects, and be more perceptive of what is around me. You can check out the photos and the stories behind them on my Flickr page (link below). The one unofficial stranger was an encounter with someone last year. If you read the story, you will understand why the admin for the group allowed an exception to their 2-month rule (all photos must have been taken in the last 2 months). As for any other photo interaction here, I'm up for anything. I will be able to post photos from my personal website once I've gotten back to the States and can fix up a dedicated URL, but not until then. Wilyone, if you see this what do you think? Have you found a PB alternative? I was interested to know how you initiated the request to take their photos because it's a lot like some of the jobs I got sent on whilst working for the paper. Regularly having to approach random people. A particular editors' favourite was to send me and a reporter out to do a vox pop to fill a space in the paper on a slow news week. Where we ask members of the public their views on a particular topic. The reporter could often get cracking comments but then when asked to have a head shot taken they would back off, making it impossible to use their great comment. With some folks no amount of gentle persuasion would get them to agree, while others were up for it. We soon got in the habit of mentioning the photo first rather than spend time getting a great comment only to be let down by their shyness. Other times I'd be out on my own (the majority of jobs) and many instances called for approaching people to see if they were happy to be in certain photos. Didn't have that many refusals overall. So far Imgur has been ok -unless their follow the PB route of course.